Eighty-two percent of the planet's people have dispensed with their physical bodies and uploaded their consciousnesses to IceBox in hopes of reaching a digital paradise. Some of the last employees of IceBox and Co. continue to provide transitional services for clients making the ascent. Benjamin has won the lottery, and as he spends his last day in the office, his coworkers battle with their own moral and socioeconomic inability to abandon their individual visions of reality - what it is and what it should be. This play was commissioned by The Goodman Theatre as a part of the 2016-17 Playwrights Unit. When the clock hits zero, THE SHOW OPENS. Construct the IceBox employee uniforms. What does one wear to leave their body and ascend to the cloud? Purchase the software and hardware we need to run our video design..and this is no small scale theatrical video design. Opus is very present character in Refrigerator who exists entirely the cloud, created by our video designer, Sid Branca. Print! New plays = new pages and your contribution will help our actors' scripts stay current. Invest in out of the box (see what we did there?) marketing, like the IceBox website. Realize our gorgeous William Boles scenic design. You may remember his exquisite work from peerless, Animals Commit Suicide, Edith Can Shoot Things and Hit Them, and Polaroid Stories. Pay rent! Pay our artists! Pay for pizza during tech! And all the other costs that go into making a production, big and small. 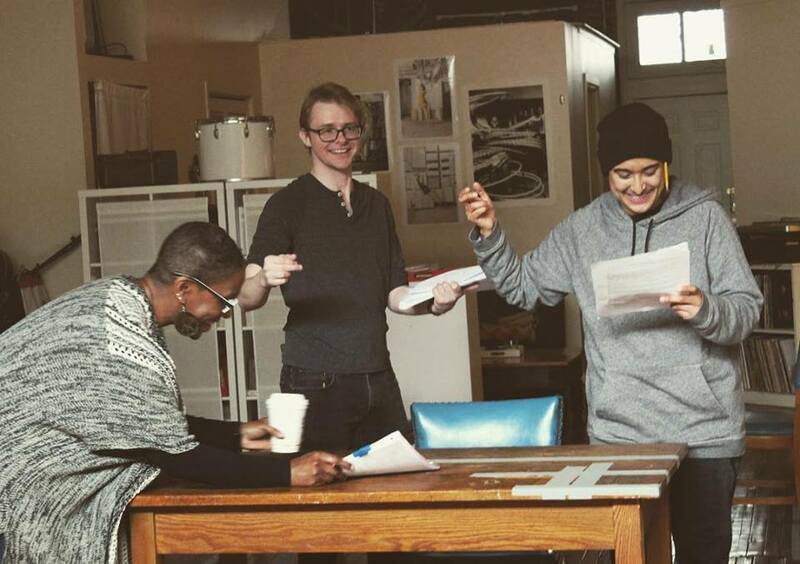 Company members Shariba Rivers, Andrew Cutler, and Avi Roque working through new pages in rehearsal. We hope you'll consider making a donation below. Every dollar raised will go directly towards producing this world premiere.